Apple has just announced the next generation mobile operating system, iOS 10 with lots of features, smaller movements and some improvements. It is still unveiled for developers and public beta testers so soon. The tenth version of apple’s mobile operating system will be available for everyone to download in September as some reviews. Apple has described about iOS 10, it is the ‘bigger update ever’, the most advanced operating system in the world. 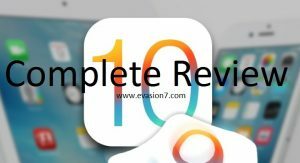 Hurry up to scroll down and read the complete review of the upcoming latest iOS 10, before download iOS 10 on your devices. iOS 10 come release as officially, you will get a notification that iOS 10 is available to install. Then go to Settings > General > Software Update on your idevice and download and install iOS 10 on your device. Otherwise, you will be able to install iOS 10 using iTunes on Windows PC or Mac. iOS 10 will be able to download without pay for apple. Your device storage space will enough to download and install iOS 10, because apple has been working hard to make iOS updates smaller. It will be able to download easily than previously. iOS 8 was released in 4.5GB in size and iOS 9 was released 1.3GB. So you will get iOS 10 in smaller size than iOS 9. If you have not enough your device storage, then you will need to remove some apps or media to get space for the new OS installation. Apple has completely redesigned iOS 10 Message app with animated responses, large emoji icons, iMessages, downloadable stickers and more. Camera effects and other extensions. Phone app gains Voicemail transcriptions, VoIP support and spam alerts. Introduce brand new iOS 10 stock app called ‘Home’. Apple Music redesigned from the group up. Map app gets smarter with improved quick controls, search and more. Photos app with memories, maps view, facial recognition and more. Siri with new SiriKit API. Live photos – Digital video image stability and full editing for your live photos. Notes collaborations – Users can work live with others in the same note. Split view in Safari – This feature is only for iPad users. You can have two safari windows open side by side. Autocorrect improvements for Thai and Korean. Most of sources have confirmed that iOS 10 will be entered to its pubic beta testing period in July by releasing the first beta interface for every public beta testers on the public beta program. For everyone can download iOS 10 after its official fall in September this year. Currently, there is no public jailbreak for iOS 9.2 to iOS 9.3.2. According to some jailbreak reviews, iOS 10 jailbreak possibility is minimum at this moment. But do not leave your hopes. Thanks for joining with us daily. We will be updating our articles day by day with correct details about the latest iOS 10 as apple. So stay with us.